Showcase your University of Oklahoma team spirit with these adorable Sooners crystal dangle earrings! 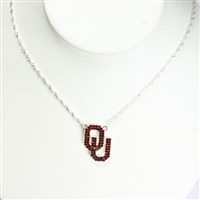 The OU logo in team colors on a silver plated setting with stainless steel earring post backs will add the perfect flair to your outfit at the next tailgate or big game event! 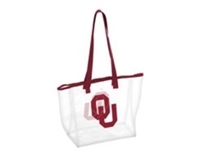 Bring your stuff to the game with this stylish clear bag that meets the Oklahoma University stadium standards. Features crimson shoulder straps and trim plus a snap closure to keep your belongings secured. This necklace features a crimson seed-beaded tassel on a vintage finish beaded chain. Your game day outfit will not be compete without these gorgeous stone hoop earrings.